Below are the sign-up boxex for the free online calculus courses that I developed. 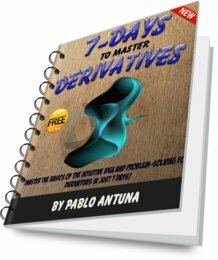 Currently the 7-Day Limits eCourse and the 7-Day Derivatives eCourse are available. More courses covering every topic in calculus are under way. The good reception that these courses had really motivates me to prepare the other courses, so they'll be ready really soon. You can subscribe to my newsletter to receive news about the courses. 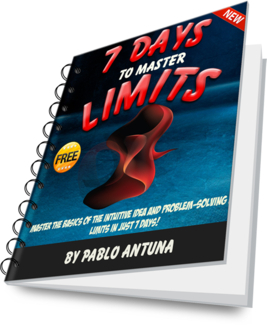 The Free 7-Day Limits eCourse is a serious multiple-part limits course. The focus of this course is limits. It is essential for you to master this basic idea because it is behind all other important concepts in calculus. I'm sure you'll find the information and exercises contained in this course invaluable to you. So, feel free to share it with your friends and classmates. Instant access to the special report: Top Ten Tips for Succeeding in Calculus. Instant download of The Intuitive Calculus Tables: The most complete calculus tables on the web, ready for print. A free subscription to my newsletter Intuitive Calculus Insights: You'll receive practical study tips and advice for you to succeed in calculus every two weeks. Subscribe below and you'll receive instant access to the special resources and the first lesson. Your first lesson will be delivered to your inbox instantly. You can unsubscribe at anytime, although I doubt if you'll want to once you realize the value of the Course. If you have already mastered limits, you can then take this 7-part course on derivatives. You'll learn the intuitive idea behind the derivative and the basic problem-solving techniques.